Upon assessing the impact of the vulnerabilities in OpenSSL, the Node team has reduced the urgency of the updates and are focusing on a release around February 9th to include some other issues. A feature-packed skeleton to get you started quickly. Builds on MongoDB, Express & Bootstrap. Comes with auth, account management, API examples, etc. 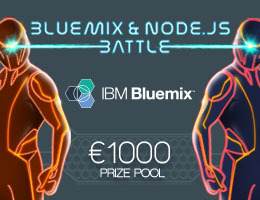 6 weeks, 6 challenges and a €1000 prizepool to manipulate the IBM Bluemix SDK in the Bluemix Node.js Battle. Join now and battle immediately to show the enemy your Node.js skills. A look at what developers say about using Node in the enterprise, why they chose it and how it improved their teams and products. Newsworthy as the ‘progress bar slowness’ issue has been resolved and git submodule support has been added. 3.7.1 is also out. A look at how you can easily hash your users’ passwords using the Argon2 algorithm and best practices. Gergely Németh dives deep into how memory allocation works in Node, and which tools you can use to find memory leaks in your application. Add folders as boilerplates and initialize projects from them using your terminal. Affected by Parse’s closure? This open sourced platform may take away some of the pain. For comparing and manipulating dates.